Struggling to get your spouse to stick to a budget? My wife and I have been doing a written monthly budget for a decade. But it wasn’t always that way. We used to just spend until the cash ran out and reach for a credit card and keep going. If you’re struggling, like we used to, with trying to figure out how to get your spouse to stick to a budget, the good news is, you can take the same steps we did and avoid the mistakes we made. To get your spouse to stick to a budget, we have to first understand the underlying issue. Are they an overspender? Maybe they afraid to look at the financial mess they have made? Are there issues with ego or control that make them not want to be open about finances and spending? Once you know the root issue and deal with that you can get started. But in the early talks about it, focus on your feelings. Ask questions, avoid making accusations, and remember you are a team. Because when money fights and money problems are behind you, you’ve not only dodged one of the top 3 Reasons for Divorce, you’re also going to significantly improve the harmony in the relationship. But there’s a lot more about budgeting, married couple finances, and getting your spouse on the same financial page, so let’s keep going. How do you talk to your spouse about your budget? Talking to your spouse about money often feels harder than it should be. After all, if we are a team, don’t team members share common goals, talk about challenges, and come up with solutions together? The answer, of course, is yes. But many couples don’t do that. For some reason, we tend to sweep issues under the rug hoping they go away, or that we win the lottery and it becomes a non-issue. Unfortunately, that is not a good long-term solution. If you have never had a serious talk about money, and if you don’t budget, the first place to start is with a meeting about money. Whether or not your spouse is “to blame” is irrelevant. You can be “right” or you can be happy and fix the problem, but you can’t always have it all. This is especially true if you’re the wife as guys can get their egos bruised easily. It’s also true if your husband is the primary breadwinner as some guys somehow feel like it’s “their” money instead of “our” money, and thus are resistant to anyone telling them what to do with “their” money. We guys are a little pig-headed and stubborn sometimes. Sometimes we let ego, machismo, or plain stupidity get in the way of doing what’s right, and giving our spouse an equal say in how we run our collective household. 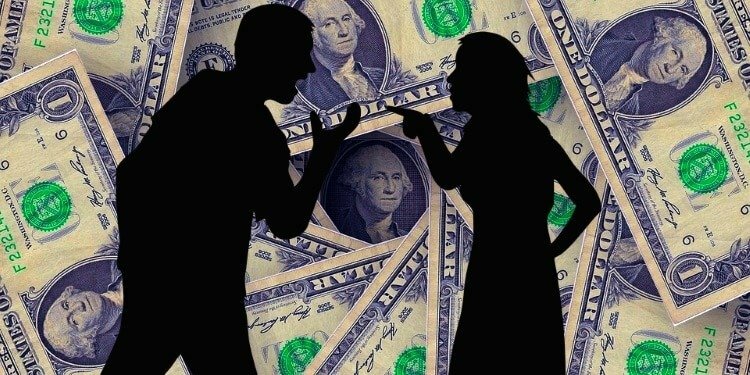 If you’re facing a husband who won’t talk about money, or doesn’t think money is a problem, you have to get to the root of his insecurity (which is ultimately what the issue is). So you have to figure out what his underlying issue is, and appeal to that. How do I talk to my husband about money problems? It’s not fair to you but we want to get this fixed, right? If he’s embarrassed, he needs to understand that failure and mistakes are OK and that they are your mistakes too (after all, you married him knowing how he was and allowed things to get to this level). The only bad mistake is one you keep making. Every other mistake is simply an opportunity to learn something and get better at it. If he’s afraid to look at the mess, then make sure he knows you have his back and that you’re in this together and that collectively you’ll clean it up. If he’s got old-school attitudes about men and women and how a household should be run, that can be a bigger challenge and it probably shows up in other areas of your marriage too. Simply talk to him about how not having a say in the finances makes you feel. Avoid accusations or blame, and let him know how important it is to feel like he values you and your opinion. Ultimately we’re talking about him respecting you and it really isn’t a money problem. If you feel like you can’t get through to him, it may be time to consider marriage counseling. If you aren’t sure it will help, don’t think you can afford it, or aren’t sure you can even get him to go, take a moment and review my linked post about Can Marriage Counseling Help, and see exactly how it CAN help you. What do you do when your husband has a spending problem? Above we got into why guys sometimes shut their wives out of the financial conversation and some tips to get them to open up. Sometimes guys just don’t want to look at a financial mess or get on a budget out of embarrassment or fear of losing control. But sometimes, guys have a spending problem. And by spending, I really mean over-spending. Ultimately, though, it’s all the same issue; ego, pride, being a control freak, and fear of those things being compromised. A budget, however, is the BEST and arguably only way to curb an over-spending spouse. When you do a monthly budget, and allocate a set amount of spending money for each of you, the other spouse doesn’t get a say or get to be critical of how the other uses that money. That assumes, of course, they aren’t doing anything illegal like drugs, prostitution, or driving while intoxicated. When the spending money is gone for that pay-period, it’s gone until the next one. It teaches us to be much more mindful of our spending and teaches us impulse control. Ultimately the best way to do that is by using the Cash Envelope System. That system has us withdrawing cash for all spending outside of bill paying and dividing into envelopes for each category (each spouse’s spending money, food, gas, eating out, etc.). Not sure if that will work or how to set it up? Check out my highly shared post which walks you through step by step! When a couple says “I do”, by definition, it’s a joining, a combining, a union. The only way that works is with complete honesty, transparency, and just dumping everything into a collective “we” bucket. Whether one spouse makes more than another or if one stays home with the kids is irrelevant. Both spouses should be contributing effort to the family in their own way. As long as they ARE contributing, how that shows up shouldn’t matter. If they aren’t contributing, then you don’t have a money problem, you have a lazy spouse and need to just deal with the real issue. I dive much deeper into the question of Should Couples Share Bank Accounts is a newer post that has gotten a lot of views on Pinterest. Check that out if you, or your spouse, isn’t convinced yet. How do you stop spending habits? So the first step is to figure out why we spend the way we do. Once we understand why we do what we do, we can set about trying to change the habit. The good news is that just by asking this question, that means you’re halfway through the process. Repetition compulsion is the technical term for when we repeatedly do things we know are bad. So whether we’re talking about smoking, yelling at our kids or being financially irresponsible, that is still essentially the underlying issue. Breaking bad habits takes time. You have to understand that it often takes years to create and build bad habits. Thus, they won’t go away overnight. Anything worth doing requires effort, focus, determination, and hard work, and forging new and better habits is no different. What is a financially irresponsible spouse? A financially irresponsible spouse is one who is reckless with their spending habits. They spend money you don’t have on things they don’t really need. More importantly, they do it without feeling like they have to let you know or answer for the mess they made. In essence, we’re talking about a child. Kids want what they want, throw a tantrum when they don’t get it and don’t understand mature communication or consequences for poor choices. But eventually, those kids grow up. In the case of the irresponsible spouse, they never left that entitled mindset. Maybe they had a parent who bailed them out of every mess they made. Thus, they never learned true consequences for bad choices. Now, as an adult (often with an enabling spouse), they continue to make bad choices, and often, their spouses allow them to get away with it. How do you deal with a financially irresponsible spouse? To fix it, we first have to let them know that this is serious. We don’t want to belittle them, criticize them, name call, or otherwise show contempt. After all, it’s the behavior we don’t like, not them personally. So it’s crucial that they know that their actions are no longer acceptable but that you want to work together to find a solution. Generally speaking, tough conversations always work best when you share how you feel, rather than criticizing the other person. Its also better to ask questions than make blanket statements. If they can’t, or won’t engage in an adult conversation, then you may want to find a good Financial Marriage Counselor near you. Your spouse needs to understand that this is a serious, potentially marriage-destroying behavior (but avoid making threats or ultimatums). If you continue to tolerate the behavior, that makes it acceptable in their eyes. Remember, no one can take advantage of you more than once without your permission. “I love you but when you make big purchases without talking to me or charge up a lot of credit card debt without my knowledge, it makes me feel disrespected because I’m being kept out of the loop. The best way to move forward on that is with a monthly budget. It’s OK if one of you is more the math nerd or spreadsheet lover, but every known expense needs to be on it as does all known income. Then you simply calculate how much is left at the end of the month. If you and your spouse are tech-savvy, consider using one of the best Budgeting Apps for Couples and then you can both keep track of everything on the fly right from your mobile device. Getting started using a budget, remembering to stick to it, and trying to stay on the same page with a spouse is tough! It often takes 2-3 months of doing it before it starts to feel natural and clicks into place. So don’t despair if it doesn’t work immediately. Be patient with yourself and your spouse and just keep going. I do think, it makes budgeting a whole lot easier when you have more than just a checking and savings account. My family has 5 bank accounts. It helps us keep our money and our budget on track. Not sure why you might need Multiple Bank Accounts for Budgeting? Check out my 2nd most popular budgeting post to find out! Did I cover everything you wanted to know about how to how to get your spouse to stick to a budget? In this post, we took an in-depth look into the world of budgeting, couple’s finances, and what to do when your spouse isn’t on the same page as you with spending. Specifically, we explored how to get your spouse to stick to a budget. If your marriage is struggling to get past the money challenges and conflicts in general, then check out this quick video on how to Mend Your Marriage that will help yours to be better than ever! What do you and your spouse argue about the most? While I am happily married and have years of successful financial & budgeting experience and run several million dollar businesses and handled the accounting, P&L and been responsible for the financial assets of them, I am not an accountant, CPA or a marriage counselor. Like all my posts, my posts are opinions based on experience, observations, research, and mistakes. While I believe all my personal finance and relationship posts to be thorough, accurate and well-researched, if you need financial or marital advice, you should seek out a qualified professional in your area.